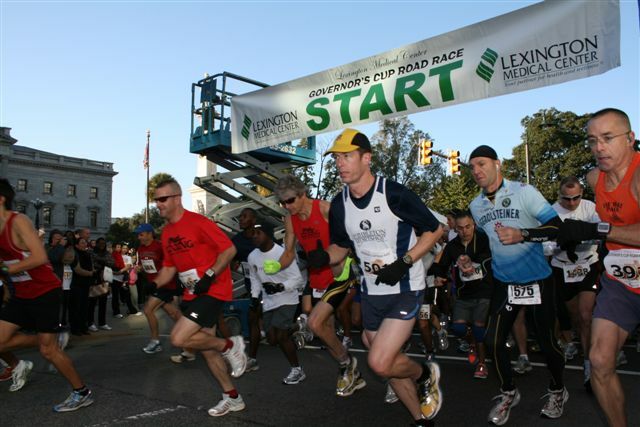 Lexington Medical Center was pleased to be the title sponsor of the 2010 Governor’s Cup Road Race, featuring half marathon and 8K races in Columbia on November 13th. Our hospital enjoys events that encourage healthy lifestyles. Several Lexington Medical Center employees trained for the half marathon. We followed anesthesia nurse June Duggan along the way. Here is her latest post on her race day adventure. The weather was perfect for the Governor’s Cup Half Marathon on Saturday. Clear and crisp at the start. I had hoped for 2:06:?? for the 13.1 mile course, but didn’t know what to expect after taking time off so close to the event. I knew I needed a maximum of 9:40 a mile in order to come in below 2:07:00 and when my first mile registered at 9:10 I knew I needed to slow my pace. I remembered the advice from Health Directions Kathy Hunter. “Break the run up into smaller segments”. So I decided to go one mile at a time using the split time feature (or lap feature) on my Timex. This is psychologically beneficial since you only have to think about the lap you’re on. The next seven laps, over a flat smooth course, were between 9:18 and 9:30. Somewhere around mile eight or nine the terrain began to roll and I lost about 30 seconds on my pace. The next three miles dropped back down to the 9:20 pace and the final 1.1 (The Hill) crawled by at 9:56. The large events, approximately 1500 registered participants, always draw such a variety of people. Along the course I saw grandparents, children, parents pushing strollers, high school athletes and first time half marathoners. I love the group dynamic of such an event. The opportunity to run with people I may not otherwise meet. Encouragement from strangers and the chance to offer encouragement to someone I may never see again. I was pleased with the consistent pace and more pleased that I was able to run pain free. My son, who placed eleventh in the 8K, would say I was pain free because I didn’t run hard enough. While there is some truth to that, it amazes me that two people can enjoy the same sport from such opposite ends of the spectrum. Perhaps that’s the beauty of running. P.S. My chip time was 2:03:51. Way to go June, I knew those legs were good for something!